1965 Bellboy bandit fiberglass 15' runabout FREE Project boat.. completely gutted, but sound. Clean title, no trailer - you haul. 1974 Wellcraft Nova Cuddy Cabin for FREE. This boat is a project boat. Condition of the motor is unknown. Hull and upholstery seem to be in decent shape. 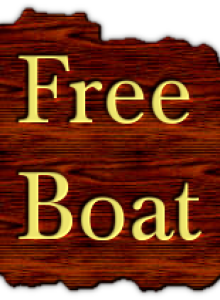 Free ocean going vessel. No motor. Needs work.